First order of business: Delete climate change information page. 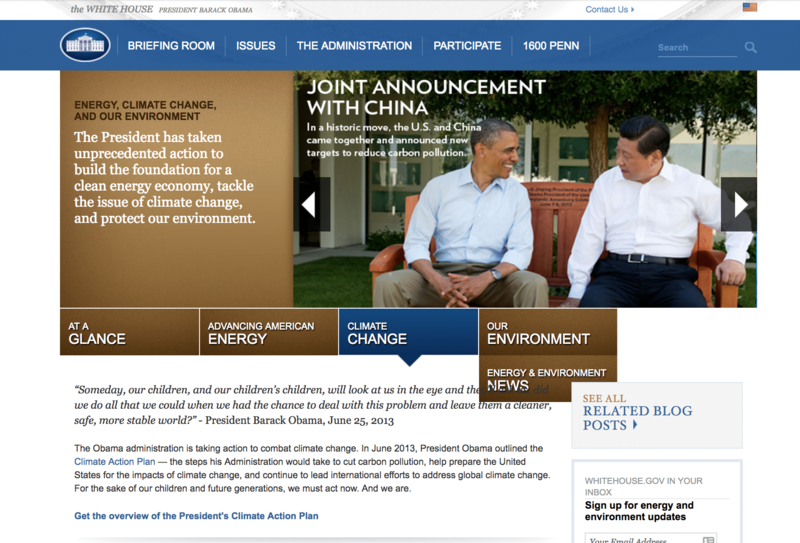 Today, there were updates to the official government website of the United States, and climate change is not mentioned on any of the new White House pages. Well, that’s not entirely true. On the page called the “America First Energy Plan,” Donald Trump says that he is “committed to eliminating harmful and unnecessary policies such as the Climate Action Plan and the Waters of the U.S. rule.” If you didn’t know, the Climate Action Plan is focused on reducing carbon dioxide emissions, preserving forests, promoting the use of alternate fuels, and focusing new efforts on climate change research and how to combat it. The new White House policy says that “lifting these restrictions [i.e., getting rid of the Climate Change Action Plan] will greatly help American workers, increasing wages by more than $30 billion over the next 7 years.” Oh, also, it will allow corporations to continue to destroy the environment and pollute Earth’s air without any ramifications. This last point is (rather notably) absent. Trump has also previously vowed to combat a number of other environmental regulations and acts currently in place. That could put in jeopardy the Clean Power Plan (CPP), which regulates carbon pollution from power plants, the Clean Air Act, which established air quality standards, and any funding allocated for clean energy research. The rest of the page is, likewise, disheartening. It asserts that “the Trump Administration is also committed to clean coal technology, and to reviving America’s coal industry, which has been hurting for too long.” Of course, job loss is a real concern; however, we must not stagnate and try and slow progress. History shows us that this never works. We also must not try and revive industries that are (quite literally) destroying our biosphere and leading to a mass extinction event. But to clarify what is happening here, the official government website usually changes over to the new administration at noon on inauguration day. That happened just hours ago. Now, the only mention of global warming is a vow to dismantle a plan introduced by President Obama to help curb anthropogenic global warming. This is not good. Here’s why. Contrary to what is asserted by a host of politicians, scientists agree that humanity is responsible for climate change. While the debate still rages in the public sector, scientific organizations around the world have come to a consensus that the Earth is, indeed, undergoing a human-induced change in climate. Although researchers are still investigating how it operates in a number of different scenarios, there is no real academic debate regarding the negative impact that we are having on the environment. And while a study done by Yale University researchers last year showed that many Americans accepted the reality of climate change (around 63%), only 48% accepted that humans are responsible. A government that lends credence to this false assumption—that humans don’t cause global warming, or that the economy is more important than the environment that sustains us—will only foster more misinformation. Fortunately, other nations are stepping up to the plate. The Climate Action 2016 summit was held in May of 2016 in Washington D.C. It came just a few weeks after more than 170 countries signed the Paris Agreement, which aims to slow the rise of global temperatures due to greenhouse gasses. Ultimately, this agreement plans to get the global temperature rise to “well below” 2 degrees Celsius (3.6 degrees Fahrenheit), which is comparative to pre-industrial levels, by 2100. At the Summit, key UN leaders urged governing officials to take actions towards reducing emissions. “We are in a race against time,” U.N. secretary-General Ban Ki-moon told the gathering at the United Nations headquarters in New York. “The era of consumption without consequences is over….the poor and most vulnerable must not suffer further from a problem they did not create,” Ban added. Even if Trump managed to withdrawal the U.S. from the Paris Agreement (which some experts argue would be very tricky), he won’t be able to stop the other countries from moving forward with it. Funding would take a hit and progress wouldn’t be as quick as it could be with U.S. support, but progress could still be made…but it would be slower. And this is what the page currently looks like, as a result of the update. Note: it’s gone. This wouldn’t necessarily be a bad thing if there was something to replace it—if there was some equivalent elsewhere on the website. There’s not. Case in point, in the field of geology, an epoch is a period in Earth’s history used to identify a specific era. For most of the Earth’s history, these periods last for millions of years. That is, until we (humans) came along. Officially, we are currently in the Holocene epoch which only covers, roughly, the past 12,000 years. Now, a team of international scientists and researchers who gathered at the International Geological Congress held in Cape Town, South Africa are saying that it’s time that a new epoch should be declared. They’re calling it the Anthropocene, signifying the significant role human activity is having on the currently developing sediment. This human-influenced epoch is marked, unfortunately, by climate change, air pollution, population growth, and significant rainforest loss. There is still some debate as to when the epoch’s start was, but some are pointing to the 1950s, when nuclear testing began and prompted radioactive elements to become a part of the sediment. In order to declare the new epoch, there has to be a clear signal, defined as a “golden spike,” of a change in the geological record. In order to declare the new epoch, there has to be a clear signal, defined as a “golden spike,” of a change in the geological record. Aside from radioactive sediment, other candidates include deposits caused from the burning of fossil fuels, the effects of fertilizer on soil, and plastic pollution, among others. It boils down to this: We have an impact on the environment. While these effects do operate alongside Earth’s natural systems, our impact is consistent and continuous. It never stops. We must take action. We must fix this…because we are the problem.